Thousands of trees create a lush feel on the University Park Campus. Michael Wallich’s mission is to keep them all healthy and happy. You might catch a quick nap on the grass under their shady boughs. Perhaps you relish the brilliant purple blooms of jacarandas in spring or marvel at the gnarled trunks of two massive Moreton Bay figs along Trousdale Parkway. 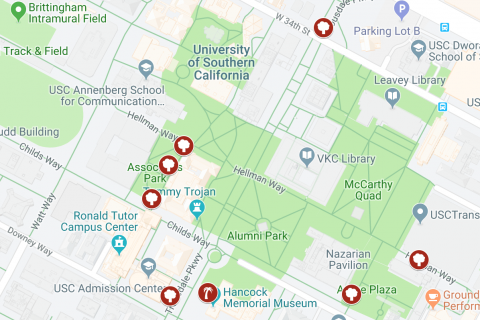 But for the most part, you probably pay little attention to the trees that dot USC’s University Park Campus. And that’s just fine, because Michael Wallich is keeping a close eye on all of them for you. 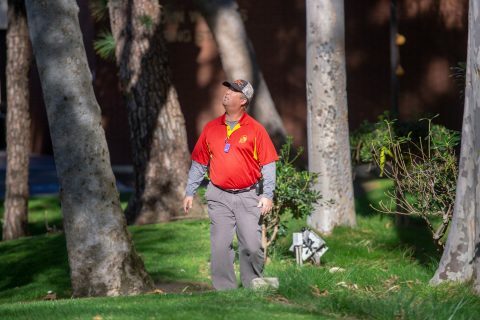 As USC’s official campus arborist, he looks after the health of more than 3,700 trees across the campus’s 226 acres. He also watches over thousands more at the Health Sciences Campus and USC’s site on Catalina Island. Click on the map above to experience an interactive tour of trees on campus. Wallich starts his daily trek by cart at 5 a.m., scanning for signs that a tree might be struggling. Compacted soil can squeeze the life out of roots. Curling leaves could signal too much or too little watering. And he’s always on guard against tiny pests that can kill towering giants. To protect his leafy friends, Wallich chastises truck drivers who drive too close to the canopy and do some “inadvertent trimming.” He generally goes easier on students when they hang hammocks, encouraging them to loop their straps around the main trunk instead of branches. 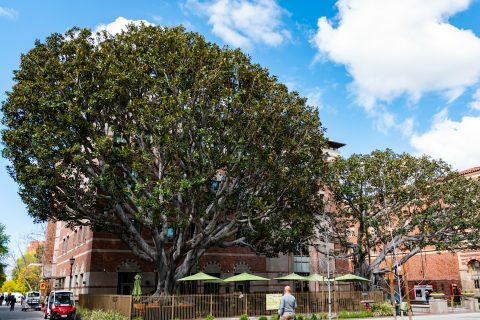 The massive Moreton Bay fig trees that shade the Ronald Tutor Campus Center are a variety of ficus. Look for their aerial roots — when they reach the ground, they become part of an ever-expanding trunk. Gold medal winners at the 1936 Berlin Olympics received an oak seedling as a symbol of the Olympic spirit. Two were planted in Associates Park by discus thrower Ken Carpenter and runner Foy Draper, both USC graduates. 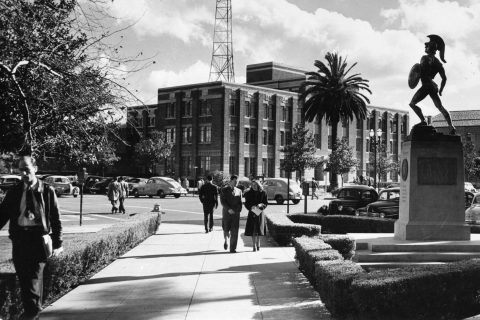 Legend has it USC planted 50 trees in Founders Park — one for each state in the union. Heavy winds or lightning supposedly took out Arizona’s tree and it was never replaced. Whether that’s true or not, Trojans from the Grand Canyon State can rest easy, knowing they are still represented on campus. A segment of petrified tree from Arizona, a gift from the Class of 1887, stands near the southeast corner of Doheny Memorial Library. It’s clear he feels a personal affinity for every root, branch and bit of foliage under his care. Wallich stoops to pick up a cluster of long, slender leaves from the pavement near Pardee Tower. He crushes the dry vegetation in his calloused hands, then raises it to his nose and inhales deeply. The bright, citrusy scent gives away its source, he says: Corymbia citriodora, or lemon eucalyptus. His knowledge of USC’s forest borders on the encyclopedic. 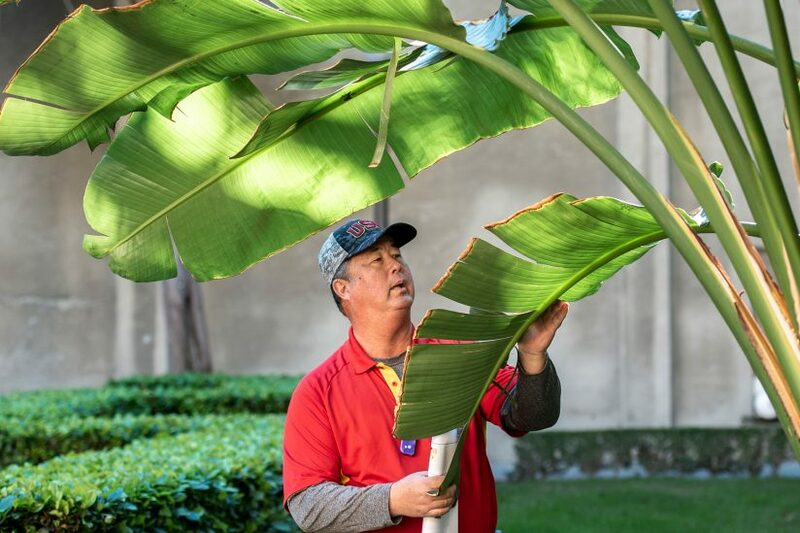 On a recent tour through the heart of the University Park Campus, Wallich showed off the sago palms outside the Hancock Foundation Building. They’re believed to be 150 years old — so they sprouted before the campus did. He pointed out dawn redwoods near Norris Cinema Theatre and noted that they’re among the few conifers that drop their needles each winter. And in a corner of Associates Park, he proudly gestured upward at the dragon tree, a prehistoric-looking behemoth named for its blood-red resin and scaly bark. Every tree holds countless details. His geotagged directory that lists each tree’s location, height, size and health keeps track of them all. “I can go to tree 652 and I’ll know it’s a Magnolia grandiflora, it’s approximately 8 years old and it has optimal health,” he said. Wallich relies on his many years of experience to do his job. He’s been certified with the International Society of Arboriculture since 1989 and worked in parks maintenance with the cities of Azusa and West Covina for decades. 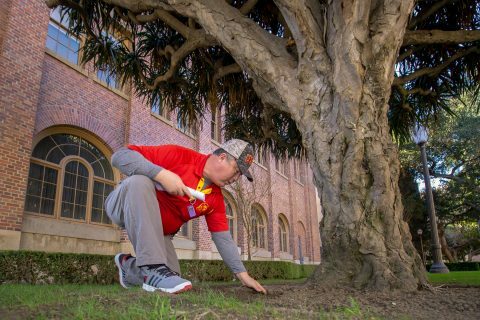 He joined USC as its first full-time arborist in 2014 and quickly brought in best practices for tree care, with the support of his bosses. 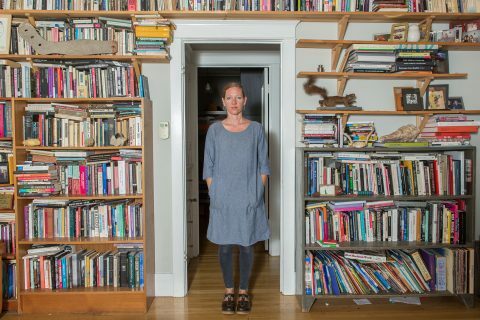 “They kind of let me write the book on how it should be done,” he said. One of his favorite techniques is vertical mulching. With the help of a team of landscape workers, he uses a special tool that blasts air into the earth at high pressure. The air harmlessly loosens the soil around roots, giving them room to grow. Wallich fills in the air pockets with his secret blend of charcoal, gypsum and a root inoculant to protect against disease. 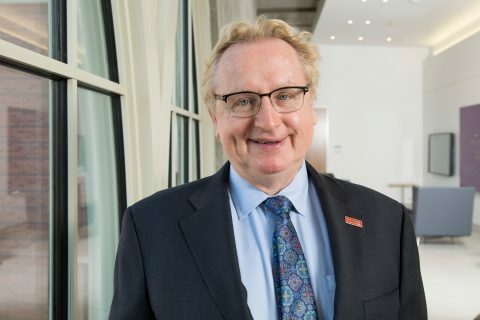 His enemies include the polyphagous shot hole borer, an invasive beetle that drills into trunks and spreads fungal diseases, and tuliptree scale, an insect that feeds on twigs and branches and deposits a sticky substance that promotes mold growth. 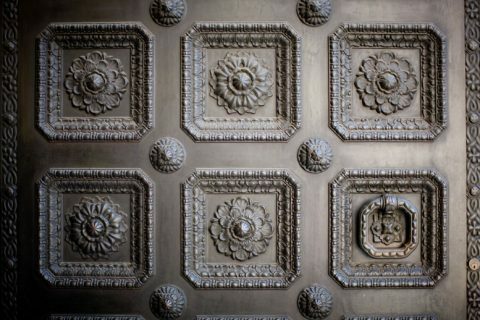 To fight back, Wallich coats the bark of sycamores and magnolias with latex paint infused with pyrethrin, a natural insect repellant derived from chrysanthemums. He prefers to use the safest deterrent he can, like spraying trees with mineral oil and soap rather than harsh pesticides. 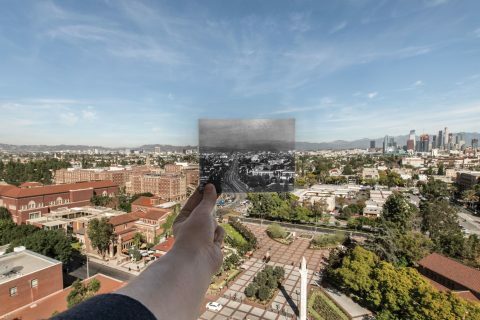 Tuliptree scale and the shot hole borer have devastated nearby campuses; hundreds of sycamores and magnolias have died at UC Irvine and Cal Poly Pomona in recent years. But USC has lost only two trees to the pernicious pests. Mike came on board right when we started to have problems with these insects. We probably would have lost hundreds of trees without him. The costs of tree damage can add up. Wallich used a U.S. Forest Service tool called i-Tree to calculate the value of USC’s forest at $11 million. Along with their economic and climate benefits, like reducing cooling costs and absorbing pollution, trees also create a soothing environment. Researchers have found links between greenery and improved mental health, including reduced stress, lower blood pressure and better mood. Although magnolias, jacarandas and sycamores are common across USC’s University Park Campus, Wallich strives for variety. He counts 125 species, including a fair share of California natives like oaks and toyons. Drought-friendly plants are also a priority, such as the vegetation gracing the redesigned entrance at Hoover Street. Wallich is especially proud of the palo verdes there, not just because of their showy yellow flowers but also because they trap the sun’s energy with their greenish branches. “Very few trees do that — mostly it’s through their leaves — but palo verde trees have a tremendous amount of chlorophyll in their bark,” he explained. He doesn’t like to play favorites, but if pressed to choose, he’s particularly fond of the sycamores in front of Doheny Memorial Library and in the courtyard at Town and Gown. And if he had to pick a preferred species, he likes camphor, which he describes as both graceful and practical thanks to its medicinal uses. He is also pleased with the five dozen fruit trees hidden around campus, many near Parkside International Residential College. They were planted through a partnership with the USC Office of Sustainability and USC Hospitality’s executive chef, Eric Ernest. Students can pick lemons, oranges, peaches, nectarines, pears and apples for a free snack. Wallich said avocados tend to disappear the quickest. When USC needs to bring in new trees, like the 350-plus saplings planted around USC Village, Wallich travels the length of the state to visit nurseries and pick out each one he wants by hand. It’s a labor of love and his way of paying back the university for putting its trust in him. And although he turns 60 this year, Wallich says he has no plans to relinquish his role as USC’s guardian of greenery anytime soon.